We are completely booked for this celebration. We hope you will join us for another Sunday very soon. 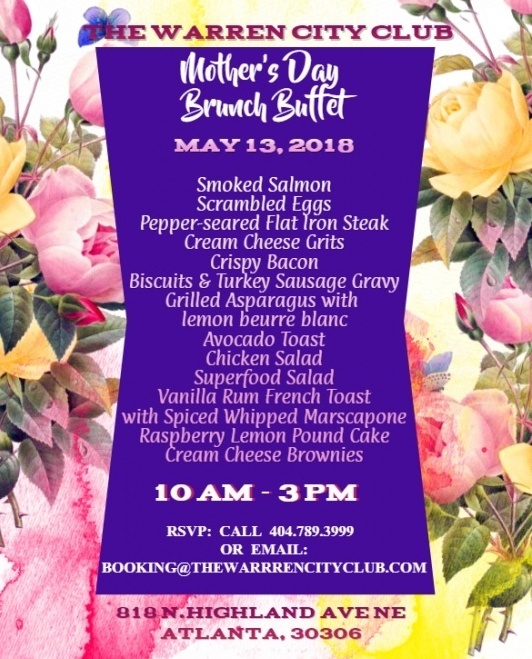 The Warren City Club is serving a delicious Mother’s Day Brunch Buffet! Sunday, May 13, 2018 is your day to let Mom know how much you love her. And there will be no doubt if you treat her to The Warren City Club’s delicious brunch buffet. Our Brunch Buffet Menu is full of awesome breakfast, lunch and brunch favorites! We will also be serving our Bottomless Mimosas for $12 as we do at every Brunch Event! 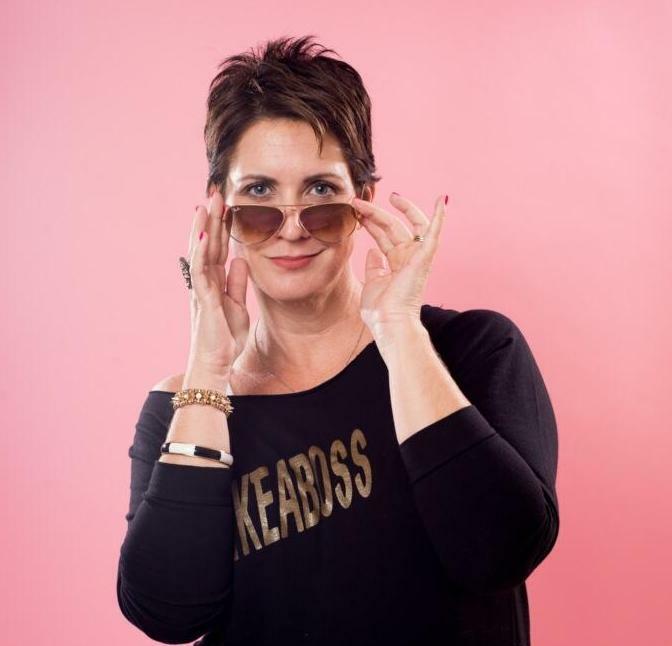 Don’t miss this chance to tell your mom how awesome you know she is! Make your reservation now between 10 am to 3 pm: Call 404-789-3999 option 1, or email: booking@thewarrencityclub.com. Adults $20; Kids 6 to 10 yrs $10; Kids under 6 yrs eat free. NOTE: At this very special Mother’s Day Brunch, we will be serving a brunch buffet only – with no a la carte menu items offered. This allows us to accommodate as many Moms as possible, while giving you all of the delicious food Chef Ashley has created. Check Atlanta’s 10 Day Weather Forecast to see if Spring will give us sunshine on the patio or if we’ll be cozy by the fireplaces that day! You;re invited to The Warren City Club’s Kentucky Derby Watch Party. 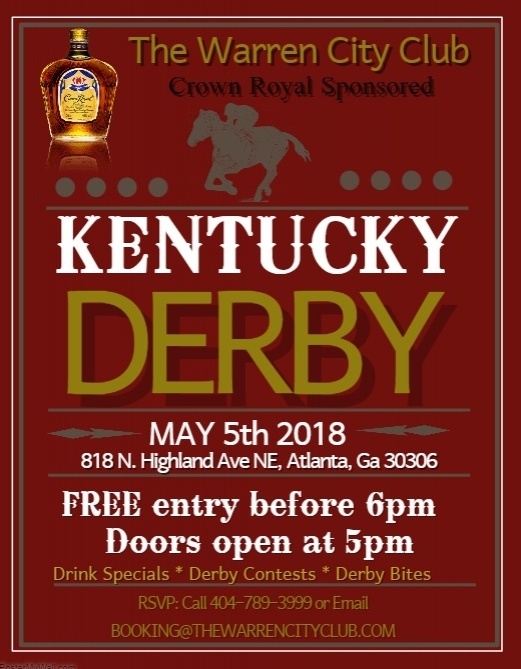 Come see the 144th running of the Kentucky Derby! Wear your best Derby garb, with a fancy Derby Hat! This is your chance to make a statement!!! Party starts at 5 pm and Post Time for the “Greatest 2 Minutes in Sports” is 6:50 pm. – Horse assignments so everyone will have a horse to pull for! You’re welcome to make a reservation if you’d like a table, or just come on up to enjoy the party – and feel free to stay all night!